The Awesome Adventures of Captain Spirit is an adventure title. This free production tells a story set in the universe of the Life is Strange series. The player assumes the role of an imaginative 10-years old boy who finally gets to experience an adventure. The Awesome Adventures of Captain Spirit is a free, narrative adventure game. The title is developed by DONTNOD, the creators of Remember Me, Life is Strange, and Vampyr. The action takes place in the same universe Life is Strange is set – another but separate game by DONTNOD. At the same time, the production features many elements that were crucial in Life is Strange 2. The Awesome Adventures of Captain Spirit tells a story of a 10-years old boy named Chris who was raised by a single father. 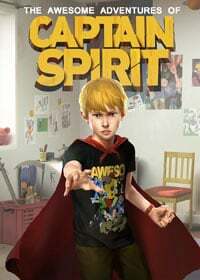 The boy spends his time dreaming about huge adventures and coming up with fascinating stories and games in which he plays the role of superhero Captain Spirit. The title focuses on one day of his life and a huge adventure which this time does not take place only in his mind. The Awesome Adventures of Captain Spirit is a narrative adventure, so we spend most of the time on exploration, chatting, and making decisions. The plot is partially non-linear. Our actions and choices influence it, therefore each time we start from the beginning, the story may be different. This is a mini sandbox filled with cutscenes and interactions. It takes about two hours to finish the title, but in order to see everything, we need to spend much more time. What is interesting, even though this is a standalone story, some decisions have an impact on the plot in Life is Strange 2. The Awesome Adventures of Captain Spirit features nice, 3D visuals carried out in a cartoonish style – the one we know from Life is Strange. Guide to Awesome Adventures of Captain Spirit contains complete walkthrough with all activities, tasks and choices. We've added tips for beginners, system requirements as well as descriptions of all locations in the game.